While a traditional “sit-down” forklift is an essential part of your material handling arsenal, in tight spaces it can feel more like you’re trying to fit a tank into a single-car garage. As business builds and inventory numbers grow, aisle-width tends to shrink. So, what happens when your trusty sit-down unit can’t squeeze down them anymore? It’s time to consider adding a reach truck to your fleet. Here’s why. Narrow aisle reach trucks are stand-up rider units with easy maneuverability that are capable of tight turns in narrow spaces. The forks on a reach truck raise and lower but also extend outward away from the mast. There are single and double reach units. To counterbalance the load on extended forks, reach trucks are equipped with two “feet” that extend out in front of the unit. This makes the base of the unit wider so that it doesn’t tip forward when picking up product at full extension. There are two different types of reach trucks: directional and multi-directional. The difference between the two is the way that they move through the warehouse. Unlike a “traditional” directional reach truck that turns around corners and into bays, multidirectional units eliminate the need to turn. Instead, the operator can, essentially, move the truck sideways to line product up in the proper place for storage. Why a reach truck over the sit-down forklift? The biggest advantage of a reach truck is its ability to navigate narrow aisles and tiers. Because these units have a small turn radius and frame, they make it possible for warehouse owners to condense aisle space and make room for more racking and product. Even a tiny bit more space for a tiny bit more product means more profit. Narrow aisle forklifts also help to reduce accidents and risks because of their size and easy maneuverability. Unlike sit-down units that have to turn as the forks go into pallets—creating risk for product and racking damage, as well as “product push-through” (pushing pallets and causing them to fall from the opposite side of the rack)—operators have the ability to maneuver the truck so that the forks are aligned with the pallet and then extend the forks into the pallet precisely. Overall, reach trucks are more cost effective than a larger, sit-down forklift. The cost upfront is cheaper, but the money-saving doesn’t stop there. Narrow aisle units require less maintenance because they are run in a specialized application and experience less wear and tear than other units that are used in multiple environments and situations. They don’t need as many fluids because they operate in a simpler way, which saves on more maintenance costs. Looking to squeeze the most out of your floor space? Thinking about how much extra product you could fit by shrink those aisles a few inches? Just contact our Greyson Sales Team here and let us help you with your reach truck needs. What is it? An order picker is a piece of equipment that is used in warehouse operations that specialize in filling individual customer orders. They are electric, narrow-aisle trucks that allow operators to go down closely placed together aisles and “pick” order items for their customers. Aside from fitting down narrow aisles, they also raise the operator up and down, allowing product to be placed in racking that is above reaching height. There are three common order picker levels—Low-level, Mid-level, and High-level. The move easily up and down narrow aisles that other sit-down units can’t turn in. Because they don’t need to turn to retrieve product, warehouse floor space is saved. The heights they reach also make it possible to stack product without making picking an issue. Because operators don’t have to leave the machine, there is less time-consuming manual labor involved. There’s no need to push ladders or steps around to find product. This also means that multiple items can be picked at the same time, rather than one by one. Being able to handle various sizes of product easily also helps productivity and saves time. Not to mention that with the machine doing the heavy lifting, workers don’t have to be as concerned with injury from carrying heavy product. Ready to put that stock picker order in? Have a few more questions? Just contact our Greyson Sales Team here. There are a lot of bells and whistles that you can hang on your forklift to help you increase productivity. Previously, we discussed the side-shifter and its benefits. Today, we are going to spotlight the side-shifter’s tag-team partner—the fork positioner. What is a fork positioner? A fork positioner is an attachment that allows an operator to move the forks on a forklift in or out automatically. They have hydraulic cylinders that attach to the tynes making it possible to move the forks by use of a lever. Some move one fork at a time, while others move both forks simultaneously. Why bother with a fork positioner? Like having a side-shifter, the addition of a fork positioner increases productivity by decreasing the amount of labor time it takes to move product. By allowing a driver to reposition just forks from where he or she is seated—and not have to readjust the entire forklift or drop the forks to move them manually—the job gets done faster. Because the operator can be more precise with fork and product placement, there is less damage in the long run. Not to mention that more accurate fork placement means less machine damage as well since there is less of a chance of running forks into a sturdy beam, pallet, or product. Which fork positioner? Fork positioners come in a multitude of options. The type and specifications that you need are dependent on the application you will be using it in. For instance, will you be handling product that is carried in the center? If so, you should consider a positioner that allows the forks to come together completely. Most positioners will leave a small gap between the forks. Visa-versa, if you are handling a particularly wide product, there are wide opening options. Aside from opening and positioning, there are a myriad of choices when it comes to fork types: hook-on, bolt-on, weighing forks (iForks) or telescopic forks are all compatible with fork positioners. With so many different specifications possible, a fork positioner can do more than just prevent pallet damage. It’s a surefire way to increase productivity. Still not quite sure a fork positioner is worth the cost? Just contact our Greyson Sales Team here with any lingering questions. Safety is always a major concern when operating material handling equipment. New safety innovations are a constant in the evolution of the forklift. Today, we are going to put the spotlight on one of the newest safety features and why blue light packages are becoming commonplace in the warehouse. Let operators know when there is another forklift is coming around corners or operating in adjacent aisles. Inform pedestrians of oncoming forklifts and other material equipment. Add one more level of indication for operators and those who work around material handling equipment by casting light up to 20 feet in front of or behind the machine. A rated life of up to 50,000 hours. Most (the most reputable) come with a lifetime warranty. They are weatherproof and temperature proof from -22 to 185 degrees Fahrenheit. While backup alarms, strobe lights, and horns are all tried-and-true safety measures, the addition of blue lights is just one more way to make sure your employees stay safe while working around or operating equipment. Ease of installation makes it a feature that can be added to any forklift, new or used. Forks: Sometimes referred to as “Tynes,” forks are attached to the front of the lift via the carriage and are used to carry loads. They come in varying lengths and widths according to need and can be adjusted on the carriage from left to right by sliding them. Carriage: The carriage is the support structure that sits in front of the mast and is where your forks are mounted. Load Backrest: The load backrest is the “gate”-like frame around your carriage that product rests against for a more secure carry. Mast: The mast ispart of the forklift that raises and lowers the load. Masts come in different types and have different specs according to the model of your lift. Tilt Cylinder: The tilt cylinder controls the amount that the mast can tilt forward and back. Hydraulic Lift Cylinder: The hydraulic lift cylinder controls the amount of vertical lift (how much the mast raises or lowers the carriage) of the mast. Cab: The cab is the main body of the forklift where the operator sits. It contains the steering wheel, brakes, controls, gauges, and pedals. Overhead Guard: The overhead guard is the frame around the cab of the forklift. It protects the operator from falling product and debris. Tires: Though this seems like an obvious definition, there are actually two different types of tires on a forklift. The steer tires are located in the back and control the direction of the lift. The drive tires are in the front of the truck and are fixed. They do not turn. Power Supply: Forklifts come with (generally) four power supply options: LP (liquid propane), gas, diesel, and electric (battery). The location of the power supply depends on which type of power you have. For instance, batteries are under the seat of your forklift, while the tank of a diesel forklift is mounted in the back. Counterweight: The counterweight is mounted on the back of the forklift and is used for exactly what its name implies—it balances the forklift by adding weight to the rear of the truck so that when a load is being carried or raised, the forklift will not tip forward. Got a lift with a lot of non-moving parts? It might be time to move on to a newer machine. The Greyson Sales Team can help you get back up and running with a quality piece of manufacturing equipment. Just contact us here. It’s not a secret that forklifts are the heavy-lifting backbones of any manufacturing facility. We rely on an estimated 855,900 forklifts (OSHA) in the U.S. to get the daily job done. But, for a piece of equipment that we work with every day, how much do we really know about the forklift and how it came to be the workhorse it is? 1917: Clark Material Handling in Kentucky was the first to create the sit-down, counter-balanced truck. They coined it the “Tructractor.” It had 3 wheels, a gas engine, reversed steering, and no brakes. It also lacked forks and was used to haul heavy loads. Initially, it was only for use in their own manufacturing but visitors—especially the military—recognized the practicality of the tructractor and began to ask for their own (Clark). 1920: Yale and Towne joins Clark in the industry with their introduction of the first battery powered low-lift platform truck (Yale). 1921: Clark unveils the first forklift—the “Truclift”—to use hydraulics to hoist material. 1923: Yale releases the first forklift featuring tilted forks. World War I&II: The forklift industry saw a boom in demand with the oncoming wars and manufacturing needs. Alongside its space-saving companion, the pallet, there came a need to stack product higher so that manufacturers could manage their space more efficiently. Between 1939 and the later years of WWII, the number of forklifts in operation went from 500 to 23,500. 1950s and 60s: After WWII, there became a greater concern for safety when operating forklifts. To make loads more stable, backrests were added. Overhead guards became a standard to protect operators from falling loads. 1980s to now: Further safety measures have been and are continuing to be standardized in forklift manufacturing: seatbelts, horns, back-up alarms, strobe lights, blue lights, etc. One of the biggest and ongoing improvements is power sources. Today’s forklifts operate on diesel, liquid propane, and batteries. Not only does this mean a wider selection to fit a manufacturer’s needs, but greater fuel efficiency. These advancements also make forklifts more environmentally friendly due to lower fuel emissions. The forklift has come a long way since its birth in 1917 and continues to adapt to our every production need. With a wide array of models, capacities, and capabilities, there is a piece of equipment that fits almost every application. Not sure what you need? Shoot the Greyson Sales Team a message and let us help you get started. 1. A used lift is a subpar lift. There is one big reason that the word “subpar” shouldn’t be used when discussing pre-owned forklifts. Most used equipment is thoroughly evaluated when the dealer brings it on to their premises. To keep a strong reputation, a used equipment dealer needs to know what it will take to make a used forklift a quality forklift. This means combing over every spec of a piece of equipment. When you buy a used forklift from a reputable dealer, they will most likely tell you the history of the truck, the application it came from, and the issues it had when they evaluated it—not to mention what they did to make sure those issues no longer exist. 2. Used forklifts are forever plagued with issues. One of the biggest concerns when buying a used lift is that you might end up purchasing some problems along with it. As mentioned above, used dealers put their equipment through the evaluation wringer. However, sometimes you can still be uneasy. If that’s the case, ask the dealer to see the forklift in person. To help put your mind at ease, most used dealers offer some form of a warranty (usually 30-60 days). 3. Used forklifts depreciate quickly. Just like a car fresh off the line, a new forklift tends to depreciate faster than a used unit. A used unit—a retired rental unit that’s at least two years old, for example—has done much of its depreciating over the time it spent on rent. So, buying a used forklift means you get the most value out of the equipment for the price that you paid. Whether you are feeling unsure or we have put your concerns to rest, our sales team at Greyson equipment can help you in your search. Just shoot us a Hello! and let us help you get started. The mast, or upright, is the vertical assembly that raises the load that is being carried by your forklift. Essentially, it does quite a bit of the work. That’s why it is important to know mast terms and types. When the time comes to discuss your mast needs, you’re prepared. Overall Height Lowered (OAHL or OAL) is the distance from the floor to the top of the mast when the rails are completely down. If you aren’t sure whether your forklift will fit through your door, check the OAHL. Maximum Fork Height (MFH) is the distance from the floor to the top of your forks when the mast is fully extended. It is this measurement that tells you how high your product can be stacked. Overall Height Raised (OAHR) is the distance from the floor to the top of your carriage when the mast is completely extended. Free Lift is the height the carriage of you lift can move without the OAL increasing. Knowing this is an advantage when working in small spaces such as trailers. If your lift has full free lift, it can rise to the top of the OAL without raising the inner rails of the mast. A single-stage mast only has one “channel” (or one set of rails) and a limited lift height. A two-stage mast (or a simplex) has limited free lift (usually 4’-6’) and is used for lower lift heights. A three-stage mast is the most common mast type. This mast has three sections that extend to maximum height. A quad mast has four sets of rails that raise your carriage and load. Still need questions answered about your mast? Our team at Greyson Equipment can help you. Just contact us here to get started. The Advantages and Disadvantages of New, Used, or Wholesale Forklifts: Which Suits Your Needs? New forklifts are the best option when you know the equipment will be putting in the work. New units are best for HEAVY USE- 4 hours or more a day. They are brand new from the factory and built to order. They come with a standard warranty (usually 2 years or 2,000 hours). This makes the cost of ownership lower because maintenance is covered for an extended period of time. The cost of a new unit can cause sticker shock for a buyer who won’t be using the forklift constantly. When purchasing a new unit, there is always the possibility that you will have a long lead time. Because the truck is built upon purchase, it can take up to months to get it. Used forklifts work best for operators who need to run the truck less than 3 hours a day, or only a few times a week. The biggest advantage up front for buying a used forklift is the lower cost. There is also the almost immediate availability. There may still be some lead time, but odds are it will be weeks compared to the months you can wait for a new unit. Even though the forklift is a few years old, it will often still come with a warranty—usually 30, 60, or 90 days. The seller won't always know the previous application/maintenance of the machine. Sometimes, there is no background information on how the machine was treated before the seller obtained it. A shorter warranty means higher maintenance costs. While you may catch a break on the initial cost, you won’t have the longer factory warranty to keep up on the cost of repairs. Wholesale forklifts are the number one option for facilities that only need to pick up heavy loads occasionally. The obvious benefit—lowest initial buy-in. Wholesale units are “as-is.” They may not be the prettiest, but they are at the right price for someone who doesn’t need to operate a forklift every day. Out of the three, these units will have the shortest lead time. With most sellers, once they receive payment, the forklift is yours. Whole units are higher-hour, older units, which means that a higher maintenance cost is inevitable. Each buying stage in a forklift’s life offers advantages and disadvantages to a buyer. While the disadvantages might be hard to stomach at first, it is important to consider which works best for your needs. If you have questions about purchasing a new, used, or wholesale forklift, just contact our experienced sales staff at Greyson Equipment for help! What is a forklift data plate? A forklift data plate is provided on every truck, new or used, to let you and your operators know the vital information for running your forklift the moment you take a seat. Today, we are going to run through the information on your data plate and make sure you’re using your lift as optimally as possible. What do all of these categories mean? SERIAL NO: While model numbers will tell you the capacity, tire type, and fuel type, these are basic components for any forklift. The serial number is specific to your forklift, so it will help a tech know what has been done to your machine in the past and let them familiarize themselves with the unit when you need service. MAST TYPE: There are various mast types including simplex, 2-stage, and 3-stage. Mast types vary from model and application, so understanding your data plate helps you know the specific mast for that forklift. FUEL TYPE: This shows you what your lift operates on: electricity (E or 24V/36V/48V), liquid propane (LP), diesel (DS), or compressed natural gas (CNG). BACK TILT: This number tells an operator how far back a mast can tilt to keep loads securely on forks. ATTACHMENTS: This section of your data plate lets you know what attachments have been added to your forklift. For example, your lift might be fitted with a side shifter, which is the most common attachment. FRONT TREAD: This number is the equivalent of the overall width of the forklift. This number helps operators determine the space a machine will take up in the warehouse. TIRE SIZE: This spec tells you the tire size and type. If your plate says “solid” your truck requires solid pneumatic tires. If it says “smooth” or “treaded,” it is referring to the type of cushion tire. It is important to always replace the tires with the same size and type. They are specific to the truck. TRUCK WEIGHT: This number tells you the gross vehicle weight of the unit, or how much the forklift weighs. The distance the forks can be offset from the centerline (shifted left or right). Knowing how to read a forklift data plate is not only important when using it, but when looking for a piece of equipment that fits your needs. If you are looking to replace your unit with the same model or one that might even fit your operations better, our experienced sales team at Greyson Equipment can help you. Just contact us here to get started. Forklifts are an essential and beneficial part of any warehouse. They make moving heavy product easier and quicker, thus improving productivity across the board. While any lift truck is helpful, the attachments that you install on your equipment can make it even more so. Today, we will discuss the side shift and fork positioner and how these attachments improve safety and productivity in the workplace. The two most common attachments that deal with Fork positioning are Side-shifters and fork positioners. Whether you have one or both attachments, your lift becomes more versatile. A side-shift fork positioner, or “side-shifter” for short, is an attachment that allows the operator to shift the load being carried either left or right within a given span. What is a fork positioner? A fork positioner is an attachment that is fitted to the load backrest of your forklift. It has hydraulic cylinders that attach to the tines of the truck so that the forks can be moved in an out by use of a lever. Loads can be moved and aligned in tight spaces. Instead of having to move your entire lift when the load your carrying isn’t quite centered, a side-shift allow you to move the load while in its intended space. Easily align forks with pallets. With the ability to make fork position more precise, there is less damage done to your forks, your pallets, and your product. Both the side shift and pork positioner make it easier to place forks where they are needed without repositioning the entire lift. Operators can remain seated. At first, it might not seem like your driver manually moving forks is time consuming but eliminating the need for your operator to dismount to move forks actually increases productivity. Aside from that, fork positioners help to make the floor safer for employees. The less feet you have on the floor, the less chance for accidents. Making your equipment as versatile as possible will help you in the long run. Installing a side shift, fork positioner, or both is a surefire way to make it easier to use your forklift in varying situations. When the time comes to consider what equipment will speed up your workflow, let our experienced sales team at Greyson Equipment answer any questions you have and get you off to a strong start. Just contact us here to get started. A forklift’s load capacity is defined as the weight that a forklift can safely carry. It is important not to exceed this load so that you continue to operate equipment safely. However, there are other factors that affect the load capacity of your lift—for example, what you are carrying and how you carry that material. The best source for this information is your lift’s load capacity data plate. The load capacity plate, or “data plate,” tells you the load that a forklift can safely lift and even accounts for tilt in mast and specific attachments. This is your most trusted resource for knowing what your truck can carry. The data plate tells you the forklift load center, or the balance point where your load is evenly centered on your forks and the load against the carriage of the lift. The closer to the end of your forks you place the center of your load, the less weight your lift can carry. When you don’t know the load center of your forklift, you run the risk of tipping your truck over and causing a serious accident. Attachments can also affect the capacity of your truck. So, it’s important to know if and how your attachment does this. Any attachment you use should come with its own rated capacities and de-rated capacities (the capacity after the attachment is fitted). Try out this calculator to see how your attachment affects your forklift. Mast height also has an effect on capacity. Forklifts with a high mast height will have two different load capacities. One for a low height and one for “carrying height,” or the capacity the truck is capable of handling with a raised mast. Even with these helpful hints, load capacity can still be tricky to understand. Knowing exactly what size of truck and capacity you need will ensure that your employees stay safe in the workplace. Our sales team at Greyson Equipment can help you find the truck and load capacity that fits your needs. Contact us here to get started! When you’re using your forklift every day, the part of your lift that is probably going to take the brunt of your work is your forks. They get scraped along the floor, ran into walls, wedged in pallet slats--among other hair-brained situations. That being said, when it comes time to replace your bent up and chipped forks, do you know what class you need? Or how to figure it out? First things first, what part of the lift do you actually need to measure? Forks are ordered by carriage class. The carriage on your lift is comprised of the two bars that hold your forks on (indicated below by the red “A” line). It does not include the load back rest, or “gate,” that runs around the outside of the carriage. Now, while you may know the capacity of your forklift—which is also indicated in the chart above—always measure before ordering forks. Different manufacturers, applications, etc. may have various reasons for fitting a larger carriage on equipment. By measuring your carriage, you make sure that you know your carriage class. If you're still not sure if you've got the carriage info down, or you have other questions before ordering forks, other attachments, or maybe even a piece of handling equipment, we can help you. Just contact Greyson Equipment here to get started. Create a schedule. One of the most important parts of keeping you warehouse clean is making sure it gets done every day. Creating a schedule—whether by shift or by individual employees—will help to make sure that the necessary everyday chores get done. Create a checklist. Along with a regular schedule of when to clean, it is important that employees understand what needs done. By creating a checklist of daily (weekly, etc.) maintenance and clean-up, you create expectations and a feeling of value in the workplace. Assign cleaning areas. Making workers responsible for certain areas of the warehouse—especially those they work in everyday—helps keep the whole warehouse spiffed up because when employees take care of their areas it makes their jobs smoother. Clean as you go. Spills happen. Even tiny ones should be taken care of right away. When workers take care of an issue right away—even just a small mess—they keep it from becoming a large problem and make a safer work environment. Keep bins around and emptied regularly. Along with keeping your supplies handy, having plenty of waste or recycling bins makes it easier to keep larger debris and unneeded waste off of the floor and out of the way. Reduce. Reuse. Recycle. Simple to implement and easy to reap the benefit. Look for places to reduce unneeded clutter. Before throwing materials away (such as wooden pallets) consider how they might be reused or repurposed. Recycle any unwanted or unneeded materials such as cardboards or shrink wrap. Implementing a recycling program not only helps to keep your warehouse clean, but shows employees (and other businesses) that you go beyond the product and consider the larger picture as a company. Once you've got your warehouse spick and span, using the right equipment when handling your materials can be just one more tool to keep it that way. If you're considering upgrading your equipment, or buying for the first time, contact Greyson Equipment here to get started. 1. Check Fluid Levels. Every battery has a certain water level that they need to run at optimum capacity. It’s best practice to check your fluid levels after every 5 charges. Be sure to check more than one cell and be sure that there is enough fluid to cover the plastic battery element. “Maintenance Free” batteries do not need to be watered. Only top of your battery with water after the battery is FULLY CHARGED. Be sure to use the right water—water that lands between a 5 and 7 on the pH scale and is not too impure. Impure water leads to battery damage. 3. Check your Battery Temperature. The environment you run your forklift in has an effect on the battery. Make sure to keep your batteries at a safe temperature (45°C or 113°F) and plenty of air circulating to keep them cool. 4. Charge your battery properly. Batteries should be charged on a schedule, not just when you have the time. While having a fully charged piece of equipment is great, it is best to wait until your battery is below 30% to charge your lift truck. Once it is full, take it off of the charger. Over or under charging your battery can decrease its life span. You should also avoid interrupting a charge cycle whenever possible. 5. Equalize your batteries. First of all, you need a charger that has an equalizing setting to do this. When you equalize your battery, you are helping to prevent stratification—when battery acid becomes more concentrated at the bottom of the battery. Equalizing your battery helps remove sulfate crystals from battery plates and helps balance electrolyte concentration. If you have a charger with an equalizing setting, it is recommended that you equalize your batteries every 5-to-10 charging cycles, or what your battery maintenance specifies. Considering buying or replacing your electric lift? Our team at Greyson Equipment can help you answer any questions you have and set you up with the best investment for your operations. Just contact us here to get started. Stand-up or seated operator 3-wheel units. Rider units have cushion or pneumatic wheels. Application: Indoor use. These forklifts eliminate emission issues. Application: Indoor use. Aside from no emissions, these trucks are space savers because they require less aisle width to get the job done. Application: Indoor use. Inside warehouse use. These units increase productivity by hastening loading/unloading time. Application: Indoor use. IC units are a cost and space saver. Many facilities run more than just forklifts on gas, diesel, or LP, and they don’t need to take up space with chargers like an electric units would need. Application: Indoor and outdoor use. Pneumatic tires mean this forklift can go anywhere (within reason). This is the most versatile type of lift. Application: Indoor and outdoor use. These units cut down on labor by making it easy to move large amounts of material on multiple carts. Pneumatic tires- large flotation tires. Application: Mostly outdoor use. With air pneumatic tires, these forklifts specialize in rough terrain such as construction sites and lumber yards. Hopefully, this chart has broken down the basics for you. If you know what class of trucks or trucks you might need, our sales team at Greyson equipment can help you nail down the fine details that come next. Just contact us here to get started! Forklift Certification: What is it? Why have it? How to get it? The Occupational Safety Health Administration (OSHA) estimates that some 77% of forklift accidents could have been prevented with proper training. Making sure that operators understand how to use equipment is beneficial to not only their employers but to employees, too. What is it? Certification shows that an operator has been trained and evaluated by the employer to operate equipment within that employer’s facility. It is required by OSHA to ensure that all operators have been trained and understand the risks that come with operating equipment. 2. Certification ensures that anyone who operates your lift is aware of the guidelines set by OSHA and shows that the employer has trained and evaluated that employee’s capability to operate a forklift. 3. Certifying operators reduces injuries in the workplace. 4. By instilling a singular training method, companies create a unified safety ideal in their facilities, which helps maintain a higher safety standard. Employers provide training for workers who will be operating equipment. While 28 states currently certify operators based on OSHA standards, every state requires some form of training for operating a forklift. 1. Complete instructional training in the form of lecture, online training courses, etc. 2. Participate in OSHA required hands-on training sessions that take place on location. 3. Be evaluated by a certified trainer from the employer. 4. Certification is good for 3 years before reevaluating is required, especially if an operator has had any incidents during their current certification. For more information on OSHA training requirements and the benefits of training, click here. When is it Time to Replace Your Forklift Tires? The condition of your tires is important when it comes to maintaining your lift. Unlike a car, forklifts don’t have a traditional suspension system, so your tires carry all of the weight of the equipment and whatever that equipment is carrying. So, it is important to know when it is time to replace your tires. First of all, what causes tire wear? This probably goes without saying, but how much you use the lift affects how often you need to replace your tires. If you are running a full shift (8 hours) five days a week, you will have to replace your tires more frequently than if you use your lift sparingly. The other major factor concerning tire wear is the environment you run your lift in. Rough terrain will make your tires wear faster. The same can be said for concrete that is rough, cracked, or uneven. 1. 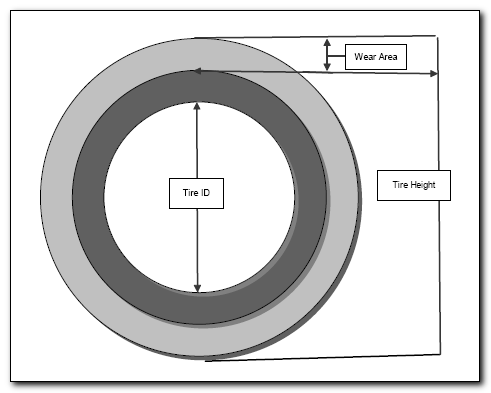 Many tires have a safety lone or “wear line” (above). The wear line is the main indicator that your tires need replaced. Once your tires have worn down to this line, it is time to replace them. 2. Another sign that it is time to replace your tires is tearing or cracking. As you can see in the example above, your tires look like they have been sliced. If you haven’t hit your wear line, but your tires are tearing, they need replaced. 3. Unlike tearing, chunking occurs when whole pieces of your tires have been torn away. If chunking occurs, tires should be replaced immediately. 4. Flat spots might be harder to notice at first than tears or chunks. Instead of seeing flat spots, you’ll likely notice that the wheel will “skip” or “thud” when rotating. This is one indication that you have a flat spot and it’s time to change your tire. 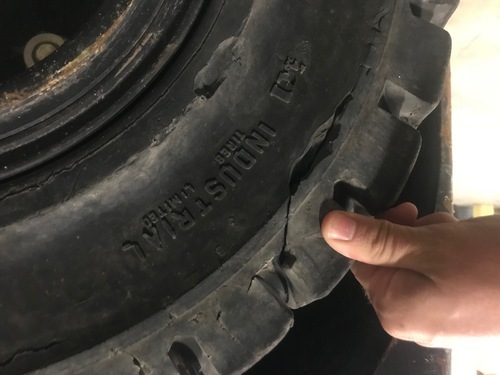 Along with these signs, other issues such as uneven wear on each tire or bent rims should be checked for at the beginning and end of every shift. Beyond regular maintenance and keeping your equipment operating efficiently, tire replacement is a safety concern. Bad tires can lead to bad accidents. 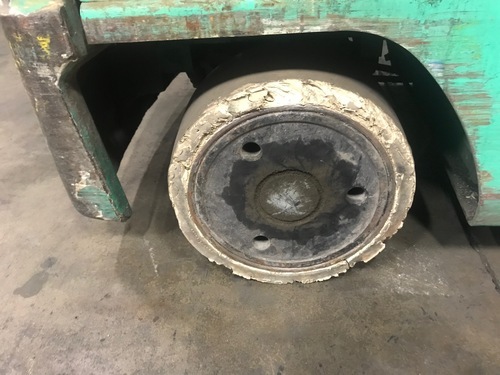 While some maintenance can be done in shop, your forklift tires should always be handled by trained and certified professionals, this includes getting an opinion on whether or not they need replaced. Let our experienced team at Greyson Equipment help you. There are a lot of factors to consider when improving warehouse efficiency. Below are 6 tips to help get you started. 1. Utilize your space. While expanding your warehouse is always an option, make sure that you are using your current space as efficiently as possible. Minimize your aisle widths. This makes more room for product. Look up. How well are you using your vertical space? Before deciding to expand out, consider whether or not you maxed all of the storage space you already have. Consider how much product you need. While having a full facility is nice and does ensure that your customer has what they need as soon as they need it, do you need that product in-house year-round? Or, do you need more of that product in one part of the year versus another? Can you utilize that space in another way? 2. Review is important. Your processes are constantly evolving. You need to keep track and analyze productivity rates regularly. Keep records of how well your product moved within an allotted amount of time. 3. Keep your employees in the loop. Beyond updating your operators on new guidelines and procedures, circle back and ask them how the new system changes have affected workflow. They work your system every day, so their ground-floor experience is crucial to success. 4. Keep your facility neat and clean. This goes beyond cleaning up the big messes that occasionally happen and worrying about the everyday little tasks too. Leaving product in aisles, not regularly cleaning up debris, and not putting product where it needs to be can hinder workflow. 5. Keep it simple. Streamlining your supply chain and processes is important. Know your truck schedule.When you don’t know when trucks are coming in, loading and unloading can become congested. This slows down processes and creates unwanted downtime. Consider assigning different shifts for shipping and receiving. By allowing each shift to focus on one task, you let your operators become as efficient as possible both individually and as a team. 6. Invest in quality equipment that best serves your needs. This one should go hand-in-hand with utilizing space. When deciding how to best set up your racking and storage, you should also consider what equipment will work best for your space (what takes up the least space and still makes operations smooth) and is most applicable for your needs (For example: if you’re only lifting 3000lbs at most, do you need a 10,000lb capacity lift?). There is a lot of thought that goes into making your warehouse as efficient as possible that can be made easier by asking a reliable source for help. When the time comes to consider what equipment will speed up your workflow, let our experienced sales team at Greyson Equipment answer any questions you have and get you off to a strong start. Just contact us here to get started. Injury is common in the workplace. Sometimes, there is no helping the accidents that occur while on the clock. However, the three most common injuries are also those that can be prevented in most cases. Slips, Trips, and Falls account for most work-related injuries. According to OSHA, 15% of accidental deaths occur this way, but there are some simple measures that can be taken to make employees safer.